The February number of Locus magazine, reporting current bestsellers in the science fiction and fantasy field, lists The Art of The Hobbit by J.R.R. Tolkien at no. 8 among hardcover books sold by Barnes & Noble/B. Dalton. Locus also includes us in the category Art Books on its 2012 Recommended Reading List. The October 2012 number of Firsts: The Book Collector’s Magazine includes two pieces of special interest to us: ‘Tolkien after Tolkien: The Silmarillion, Unfinished Tales and The History of Middle-Earth [sic]’ by Robin H. Smiley, together with ‘The Silmarillion, Unfinished Tales and The History of Middle-Earth: An Annotated Checklist of the American First Editions’; and ‘Weaving Fantasy and History: Guy Gavriel Kay’ by Kathryn Smiley, together with ‘Guy Gavriel Kay: [A] Checklist’. The Tolkien article includes a brief biographical introduction, very compressed and with a few unfortunate errors, such as that Tolkien was taken to England in 1895 after (by implication, because) he was bitten by a poisonous spider, one of the places Mabel Tolkien and her sons are said to have lived together was Jane Neave’s farm, ‘Bag End’ (Mabel never lived there), and The Hobbit was published in 1936 (not 1937). The Tolkien checklist is based in large part on J.R.R. Tolkien: A Descriptive Bibliography, which went to press before the American edition of Sauron Defeated (HoME no. 9) appeared and does not include the later volumes of The History of Middle-earth. Mr. Smiley finds it unfortunate that the Bibliography has not yet been updated to include volumes ten through twelve – apparently he is unaware of The Tolkien Collector, which has served this purpose since 1992. Smiley’s checklist also includes posthumous books by Tolkien not encompassed by his article title, and a selection of Tolkien-related biographies and reference works. Kathryn Smiley’s long article on Guy Gavriel Kay is also significantly related to Tolkien, in that it discusses, more fully than any source we’ve seen before, how Kay came to participate in the editing of The Silmarillion (1977). Kay grew up in Winnipeg, Manitoba, the son of a surgeon, one of whose colleagues was Dr. Alan Klass, who was the father of Baillie Klass, who in 1967 married Christopher Tolkien, who became J.R.R. Tolkien’s literary executor. Kay met Christopher several times before Tolkien died in 1973, and when Christopher began to prepare The Silmarillion for publication, he asked the twenty-year-old Kay to act as his assistant. Kay moved to Oxford in 1974 and stayed for a year. In his spare time, he explored, wrote poetry, made notes for his own projects, and met one of his favourite authors, Dorothy Dunnett, who was herself a Tolkien fan. Ms. Smiley unfortunately could not go into detail about Kay’s work with Christopher Tolkien, because Kay prefers not to discuss it, due to its confidential nature. The October Firsts came to our attention when it appeared on eBay and sold for more than twenty dollars. We went to the magazine’s website and bought the back issue for ten dollars including postage. It occurred to us the other day that we said little in our J.R.R. Tolkien Companion and Guide about the route young Ronald took when he, his mother, and his brother sailed from South Africa in 1895. Did he go north by way of the Suez Canal, or did his ship sail westward, around the Cape of Good Hope? We knew from The Tolkien Family Album that the family group had embarked on the steamship Guelph at Cape Town, and arrived three weeks later in Southampton, England, but we had not looked into this further. An Internet search led us first to an article on the Polish Tolkien fans’ Elendilion website; this, however, is concerned mainly with the later history of the Guelph. The Guelph, we found, was a relatively new steamship at the time of the Tolkiens’ sailing. Measuring 4,917 gross tons, it was launched at Belfast in 1894 and at first was employed on the Union Line’s Durban–Cape Town–Tenerife–Southampton ‘intermediate service’, that is, it was a vessel designed for cargo and passengers rather than the speedy shipment of mail. In 1895, then, the Guelph followed a route which included just the far southern part of Africa’s east coast (Durban and Cape Town), as well as the west coast northward to England by way of the Canary Islands. A photograph of the Guelph, with a single funnel and three masts, is reproduced in The Tolkien Family Album and on several Internet sites. Much later in life, according to John and Priscilla Tolkien in The Tolkien Family Album (p. 18), Tolkien remembered from the long voyage to England on the Guelph ‘two brilliantly sharp images: the first of looking down from the deck of the ship into the clear waters of the Indian Ocean far below, which was full of lithe brown and black bodies diving for coins thrown by the passengers; the second was of pulling into a harbour at sunrise and seeing a great city set on the hillside above, which he realised much later in life must have been Lisbon’. Having looked into the Guelph, we became curious also about the Roslin Castle, one of the ships of the Castle Mail Packets Co. (one of a series named after castles; this was the second of that name), on which Tolkien’s mother Mabel Suffield travelled to South Africa in 1891 to marry Arthur Tolkien. 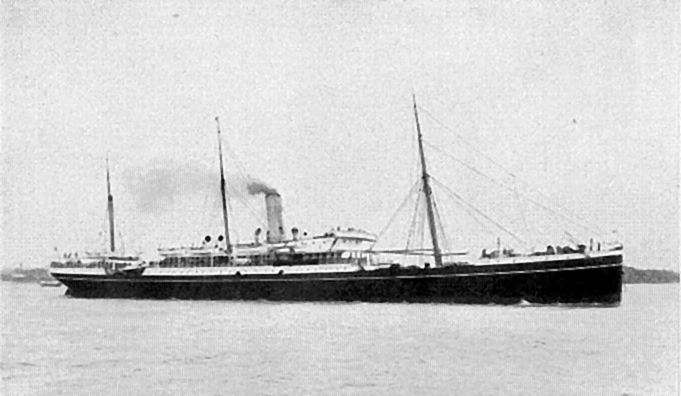 The Roslin Castle measured 4,267 gross tons at its launch in April 1883, and had one funnel and two masts (ships of this type typically used sail as well as steam). In 1888, she was returned to her builders to correct defects, in particular a tendency to roll, and at that time was enlarged (to 4,487 gross tons) and her passenger accommodation improved. At the time of Mabel’s voyage, the Roslin Castle sailed the west coast of Africa, like the Guelph a means of transporting mail to and from South Africa, but able to carry passengers as well. As a relative newcomer to the Tolkien universe it is interesting to consider the various generations of Tolkien research and researchers and the critical comments contained in this blog. I would see the Humphrey Carpenter and Christopher Tolkien era (or age) as the 1st, wherein the basic biography and letters appeared along with the release of unpublished material under the editorship of Tolkien’s son. This mostly occurred during the 1970s. The 2nd age could cover the period of the 80s and 90s and include the authors of this blog plus other prominent researchers such as Anderson, Shippey and Flieger, though these also may flow over into, or belong within, a 3rd age when, post the appearance of the Peter Jackson films, there was a proliferation of material on Tolkien and his publications. Are we now entering the 4th age, where blogs are ubiquitous and lead the research agenda? It is in this light that I read this blog and that I, as a 4th ager, try to catch up with Tolkien scholarship over the last half century. Thanks to the authors of this blog, this catchup task is made easier. Thanks for this, Michael. Carpenter’s biography and Christopher’s early editions are milestones in Tolkien studies, of course, but one must not overlook the years of criticism and reviews that came before. The 60s in particular were a decade of considerable effort, following on the American paperbacks of The Lord of the Rings – the first Isaacs and Zimbardo volume of criticism, for example, appeared in 1968, but there was much before that, in the Tolkien Journal, Orcrist, etc., in the days when Tolkien enthusiasts leapt on every scrap of information or criticism, there being so little of it at the time. Carpenter’s book was, and is, very significant, and the published letters (in 1981) are very useful (if little read by a surprising number of Tolkien fans); and with these must be ranked the published Silmarillion, Unfinished Tales, and Christopher’s other books, so many and so complex that some critics prefer to pay them little notice and some fans give them a miss, much to their loss. In a sense it’s artificial to think of Tolkien studies in ‘ages’ or phases. The pre-Biography, pre-Silmarillion, pre-Letters writings make for a nice grouping, but after that it’s harder to come up with divisions, only landmarks such as Shippey’s Road to Middle-earth and Doug Anderson’s Annotated Hobbit. The Jackson films inspired new works of Tolkien criticism, not necessarily because an author had anything new or insightful to say, but because a publisher wanted to capitalize on publicity; but also we have had, in 2004–2006, the 50th anniversary of the publication of The Lord of the Rings, and now the 75th anniversary of The Hobbit, and those too have driven some of the more recent publishing. As for blogs, those are in the same line as Tolkien-related websites, discussion forums, and listservs, allowing fans easy expression when previously they would have written letters to fanzines, or produced fanzines themselves. Lately we’ve been going through stacks of printouts from e-mail discussions about Tolkien and noting how very miscellaneous they all were – sometimes with a nugget of new information or particularly good interpretation, but so very occasionally that we wonder now why we bothered to print out so much, and how we would have been able to locate anything in it without making an index. Blogs, at least, provided they endure on some public server, are searchable on the wider web.